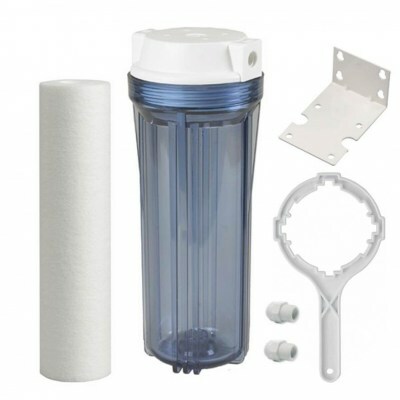 This package is the ideal pre-filtration unit for Ultra Violet Water Purification Systems up to a flow rate of 15 LPM. The pack contains a high quality clear housing with 1/2" female ports, 1/4" push fitting adapters, Wall Mounting Bracket and Housing Head, Bolts to mount the head to the Bracket, a 5 micron sediment filter and a housing spanner. The clear housing is ideal for use under the sink where not exposed to direct sunlight and has the added advantage of enabling the user to see the condition of the filter inside the housing without having to remove the bowl and filter. We recommend using the white UV prefilter system if your installation area is exposed to daylight. This is because of possible bacteria or algae build up inside the housing. You have the option via the drop down options above to add additional filters, plus also a standard goose neck tap and fitting kit (includes feed-in valve, tubing and tap and tap accessories). Watts Flowmatic filter housing with buttress threads for 9-3/4 in. filter cartridges. Made from NSF and FDA grade materials. 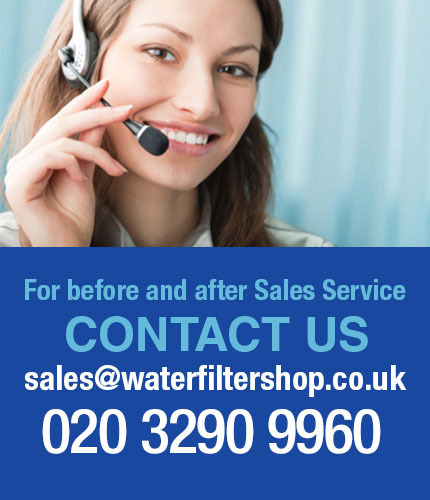 Our under counter filter housings are manufactured from the highest quality, FDA grade, 100% polypropylene and acrylic styrene. Leak-proof sealing is accomplished by compression against a top seated EPDM o-ring located in the housing’s sump. Thick wall and added ribs make the housings ideal for a wide range of applications. Polypropylene construction provides excellent chemical resistance with most acids, alcohol, ammonia, oils, plating solutions and many aggressive chemicals. The Watts Flow-Pro® Polypropylene Melt Blown Cartridges offer exceptional value where depth filtration is required. They are available in a wide range of micron sizes available, the most common is 5 micron. The Watts 2.5 x 10 Inch Melt Brown Cartridge fits all standard slimline (2.5 Inch) 10" water filter housings.